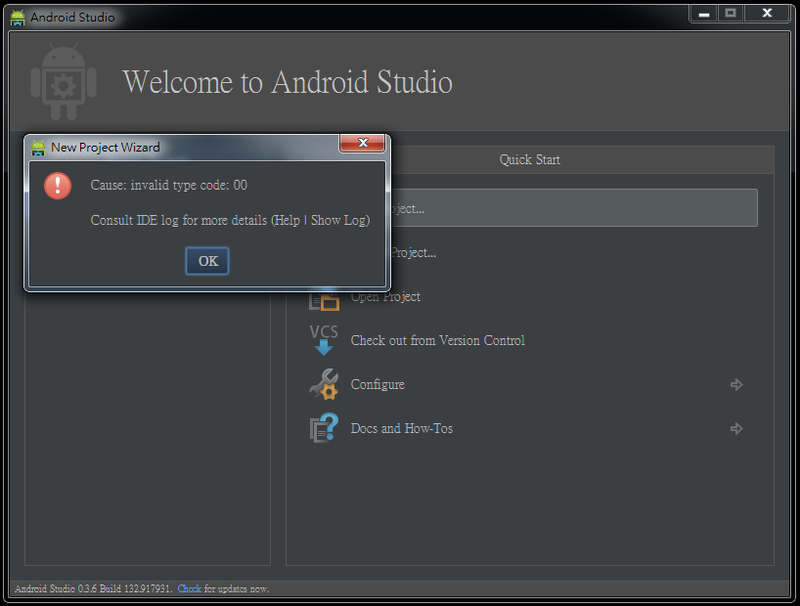 Restarting Android Studio doesn't fix the problem. And from the launch screen shown above, I can't check out the IDE log for more details as the instruction says either. Has anyone encountered this issue, and what's the fix? I am on a Windows 7 64-bit machine and have Oracle JRockit 1.6.0 as the JVM if it helps. The thing is that I can download 'http://services.gradle.org/distributions/gradle-1.8-bin.zip' without issues, so I don't know why Android Studio would fail to obtain it. Is it possible for me to manually put the file somewhere so the action would not fail? It turns out that Gradle (or Android Studio) doesn't like for JRocket JVM to be set as the default Java runime. Set JAVA_HOME to use JDK completely fixed the problem as far as I can tell. It looks like one of the files that Gradle has downloaded has become corrupted. I'd try removing all Gradle cache directories; there should be a .gradle directory in your user home directory (I'm not 100% sure where it will go on Windows; you may need to hunt around for all .gradle directories to find it) as well as the .gradle directory in your project's root. Though if you're just trying to create a new project each time, then it will create a new project root directory each time, so the project-root-specific one isn't going to be causing your problems. If this doesn't help you (I'm a little skeptical that it will), then you'll need to see what else is going on in your system that would be corrupting these files. If you have antivirus or other sorts of systemwide utilities that aren't part of Microsoft's base operating system, have a look at temporarily disabling those to see if you can isolate the problem. Not the answer you're looking for? Browse other questions tagged android android-studio intellij-idea gradle jrockit or ask your own question.